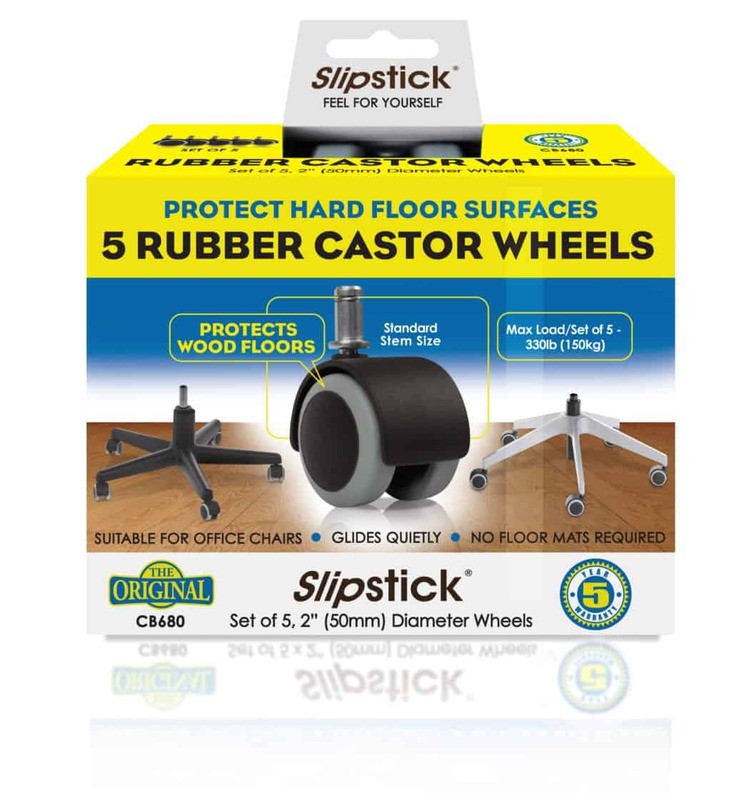 Slipstick Foot Floor Protectors have released a new innovative range of office chair wheels that replace traditional plastic office chair wheels with other alternatives that protect hard floors surfaces and help to stop scratching and gouging. 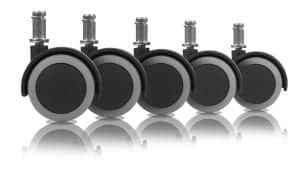 The first product is a set of rubber castor wheels that are a universal replacement for standard plastic castors and eliminate the need for unsightly and cumbersome plastic floor mats that look untidy and cover the natural beauty of your timber floors. The rubber replacement castor wheels glide quietly and smoothly and can be changed in less than 4 minutes. You simply remove the existing plastic wheel and stem and replace it with the rubber castor wheel and stem. The set of 5 rubber castor wheels are super strong and have been designed and tested to carry a maximum of 150kg /330 lbs total weight chair and rider. Perfect for protecting hardwood, laminate, tile, slate, marble, and all other hard floor surfaces. The second product is the new and modern looking roller blade style office chair wheels. They provide an EASY, EFFECTIVE AND INEXPENSIVE WAY TO PROTECT YOUR FLOORS and are 100% safe on any surface. These rollerblade style casters with premium double ball bearings make chair rolling silky smooth and quiet on any hard surface. Be the talk of the office!! Modernise the look and upgrade the performance of your office chair or stool by replacing cheap floor marking plastic castor wheels with these stylish smooth rubber roller blade style castor wheels. 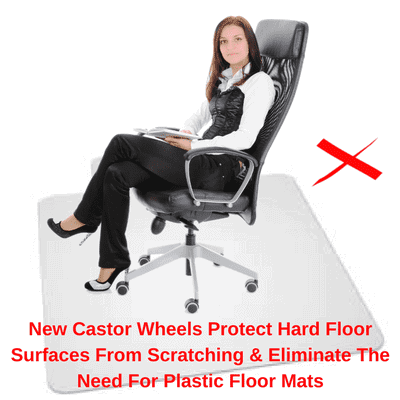 No need for chair mats, they’re safe for all floors – There’s no longer any need for an unattractive chair mat because these premium rubber castor wheels are safe rolling on hardwood, laminate, vinyl, tile, slate, carpet and protect all types of floors. Compatible with major brands – standard stem size: 7/16″ (11mm) diameter x 7/8″ (22mm) length and great for replacing cheap plastic chair rollers on any chair with swivel castors. Please note: These do not fit on Ikea office chairs that have a 10mm stem. You’ll wish these were available years ago.